A popular tactic in the professional nonhuman animal rights movement is to utilize species-specific or issue-specific campaigns to increase public concern, motivate participation and extend movement support. 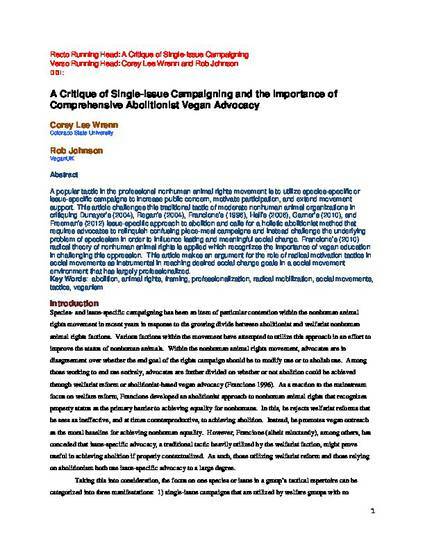 This article challenges this traditional tactic of moderate nonhuman animal organizations in critiquing the issue-specific approaches to abolition advanced elsewhere and calls for a holistic abolitionist method that requires advocates to relinquish confusing piecemeal campaigns and instead challenge the underlying problem of speciesism in order to influence lasting and meaningful social change. The article applies Francione's radical theory of nonhuman animal rights, which recognizes the importance of vegan education in challenging this oppression. This article makes an argument for the role of radical motivation tactics in social movements as instrumental in reaching desired social change goals in a social movement environment that has largely professionalized. Wrenn, C. L., & Johnson, R. (2013). A Critique of Single-issue Campaigning and the Importance of Comprehensive Abolitionist Vegan Advocacy. Food, Culture & Society, 16(4), 651-668.